It's that time again! Time to update the Tom's Hardware BestConfigs! Once again, we are opening the field to user recommendations to get the best consensus for the absolute best of the best in each category. Post the best configuration you can put together for the following build category and our editorial team will pick 5 of the best to be put up to a public vote right here in the Systems forum. The top-ranking build will go on to become one of Tom's Hardware BestConfigs and you'll get the credit for having put together a brilliant build with a special credit in the feature article. See below for quick-copy/paste text of the BBcode. You can also use the Tom's Hardware System Builder to build your recommendation and use the BBCode export option at the bottom of the build. If you do, be sure to include a link in your post to your build on the app for quick viewing. Micro-ATX cases often do little justice to micro-atx's small size, or when they do, its expensive for a case. So be prepared to pay a premium 100+ to 150+ for a smaller (small form factor-ish HTPC-ish) case, or pay the usual pre-100 for a larger-than-needed case. Doesnt make sense, it does. Also, going for combos on Newegg is smart, as you can indeed squeeze in nice extras. This is a fully SLI compatible rig. It fits the Micro ATX form factor while still retaining awesome cooling thanks to the Thermaltake Armor A30. It has full 1600MHz ram, making best use of the XMP ram profile. The Scythe big Shuriken provides the cooling of a full 120mm fan, while retaining that key low profile. Plus.... It's named after Boxxy! The Noctuac cooler fits just perfectly in the case(research from reviews show this) and if you overclock the 2500k with the amazing cooling of this unit you are looking at one very nice machine with your dual SLI'd 560's. What does your build have to do with microATX? Ooops! Well, the first build did I thought and I guess I forgot the subject title. Sorry for randomly posting my rig specs!! oh so you posted it on 2 threads. awesome man. Haha, I laughed at that one. Cooling: Dare I say it? YES... Stock AMD cooler. No real need to go with anything else as the price limit of $1200 keeps the upgrade from happening. Better to spend the money on other top performing parts and capabilities in the system and upgrade this aspect later on as it gets the job done perfectly. Total price for this build from Newegg is $1194.91 at the time of writing this including the other option not listed in the primary build specs. Yes I am am an AMD fanboy so I stuck with what I like personally which is what matters The system is designed to be as future proof for a micro ATX as I could design at this time. - The mobo supports the new AMD bulldozer processors (confirmed by msi) which will be an easy future upgrade. It also has a slew of awesome features and abilities such as... reasonable onboard graphics so when it does come time to retire the build, the vid card can be stripped out and onboard video can be used as an energy efficient desktop. Another plus is the 6Gb/s on-board raid controller, USB 3.0 and SB850 South Bridge. - The ram was carefully chosen as it is rated to pc2000, however with the new bulldozers, it will be run at 1866 so I may be able to squeeze a little extra out of it timing wise. That and Corsair XMS memory has NEVER let me down after all these years. 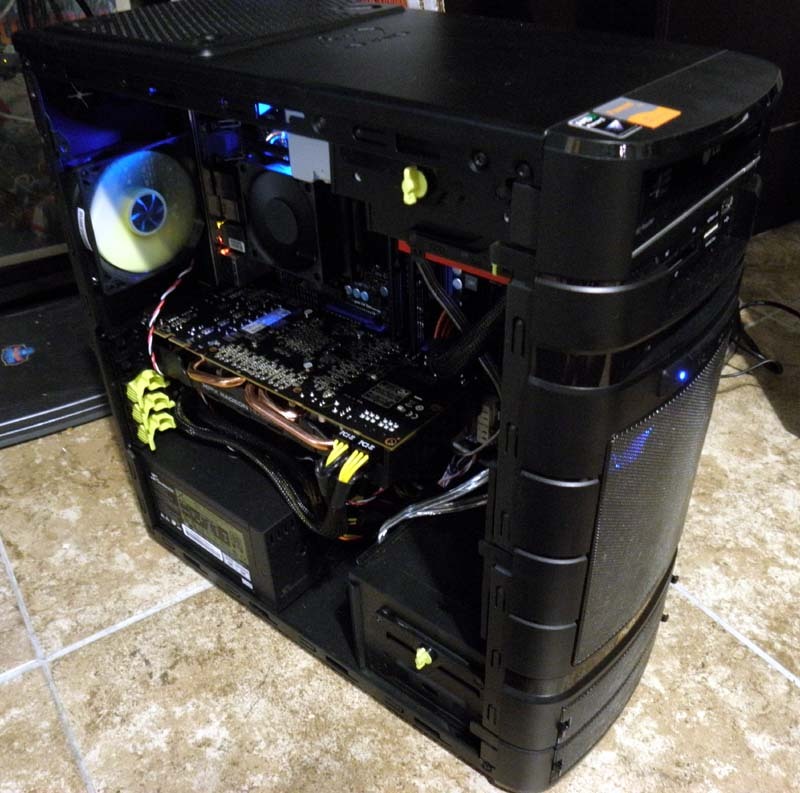 - The case is an outstanding build for a Micro ATX. Builds like a good sized mid tower with bottom mount power supply, plenty of room for whatever vid card you want... provisions for water cooling and multiple bottom drive and bay options. - Video card was chosen as it is a short design at 10" so fits the case well. Also it runs a slight overclock for a 9850 out of the box at 830 core / 1300 memory. Not to mention the XFX lifetime warranty on the card... impressive. - The OS SSD Hard drive is a small beast... uses the latest SandForce SF-2200 for up to 555MB/s read --- 495MB/s Write and up to 80,000 iops. For my own build I am using this same drive but in a 120gb config. The price limitations of this thread keep it at a 60gb which is plenty for gaming, especially with the 500gb storage drive. - Power supply is a gold certified unit. Efficiency is key to me! And it is a perfect match for this build. It is also modular which is mandatory in a SFF build. You'll have to remove a drive cage for that graphics card, but since it is removable in two parts I'd say it's a viable build. Kind of long though. The problem is that it's NOT SFF. It's a mid-tower. The minimum height for a FULL ATX mid tower in "traditional layout" is 16.875". I'd say that yours is close enough. Actually I should just tell you the whole truth. Not only is your case a mid-tower, but nothing Micro ATX is "SFF". SFF originally stood for Shuttle form factor and was later bastardized by a few review writers to include "Small Form Factor" lookalikes. AMD later standardized this size as the DTX form factor. Tom's Hardware actually wrote the book on it back in 2006, so unless you're refering to a two-slot design I don't want to hear it. Not fancy at all compared to my builds of old, but she gets the job done and performs stellar! And wow this baby is QUIET! With the cpu fan set to 25% with a ramp up at 40C, I can barely tell the PC is on. Set at 25% cpu fan speed, she sits around 26-28C unless pushing it with a taxing application. The stock case fans are very quiet which was a surprise yet the case vents very, very well. And so far, Have not had a game that I could not max everything and frag to my delight! Need to buy some games that really push the card however as most of my pc games are at least a year or more old. Overall could not be more happy with the build! Here is a pic... again, nothing insane or fancy but very functional.